Over the years there has been a progression of a thought that people should do what the pastor says because he is the “Man of God.” I have heard it used as though a man has carte blanche power because he has that title. Often the title is self imposed and used as leverage with the people. Allow me to offer a spin on this teaching from my observation of Dr. Jack Hyles. Dr. Hyles sought to be a man of God, but he did not believe that people should listen to him because he held that “title.” In fact to him it was not really a title at all. He believed it ought to be a description. Every Christian man should be the man of God in whatever role God has placed him. The husband ought to be the man of God in his marriage. A father ought to be the man of God in his home. The fact is, every man who claims Christ as Lord ought to seek to be the man of God in the positions he holds. But, what of the special designation oft given to preachers, in particularly pastors, as being the “Man of God?” I do not buy it. A man in the pulpit ought to be a man of God, but the pulpit does not make him so. Certainly he holds a position of God, but that position does not make him a man of God. Many men who hold the position of God are not men of God. Saul held the God ordained position of king but he was not a man after God’s own heart. David, who replaced him in the position was a man after God’s heart. Therefore we can clearly see that the position is not a justification for claiming the title of “man of God.” The position gives a man certain positional authority, but being a man of God requires one to seek after the heart of God which, by the way, leads more to servanthood than dictatorship. Let me share some specific thoughts regarding this designation. 1. A man of God is one who seeks after God not power or position. A man of God is one who seeks after God not after the authority of a title or position. If someone seeks it they will not find it. There may be temporary power, but no permanent power or position. 2. Every man ought to seek to be a man of God. Every husband, every father, every pastor and every man who holds an authoritative position ought to seek to be a man of God. We all are leaders in some area of our lives. So, it behoves us all to seek to be men of God for those areas. 3. Therefore, a preacher, or pastor ought to be a man of God with or without the position. Brother Hyles was a man of God to me long before he had an authoritative position over me and long after as well. He earned that with his life. The thousands who came to hear him teach and preach did so because they trusted him to help them. No one made them come. 4. A church should seek a pastor to fill the position who seeks to be a man of God in the position of God. You do not hire a man to be the man of God. You hire a man to be the pastor who seeks to be a man of God. When one arrives he quits seeking. 5. Pastors should not use the title “man of God” to authorize their activities but to monitor them. Being a man of God means you are the one in subjection to the leading of the Lord. A man of God does not yield a rod of power, but a role of servanthood. We are to minister! 6. A church should follow the man with the position, but we should seek personal guidance from one who has proven with his life to be a man of God. We follow a man who is in authority. We trust a man who walks with God and seeks after Him. People trusted Brother Hyles because his life showed him to be a man of God, not because he dictated that they do so. 7. A pastor who humbly respects his position will more likely be a man of God, than one who wields it like a weapon. The great men of God I have known were all pushed up to the role. They did not seek it nor did they necessarily want it or relish it. It was more troublesome than anything else. In many cases it became a distraction. 8. All men in the position of God make mistakes, so a humble spirit is necessary to prevent them from being like Saul and help them be like David. Tragically, positions of God turn some men into men of pride rather than men of God. A humble man in a position of God will most likely be a man of God. 9. It is good when the people of God call their pastor a man of God because he has proven to be so. 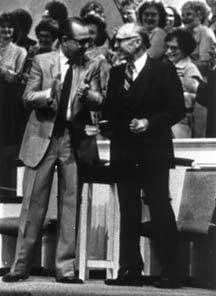 There is nothing wrong with me calling Dr. Hyles a man of God, because he proved to be so in his life. However, he did not designate himself as such to me. The leaders of Fundamentalism were placed there by others and not themselves. 10. It is dangerous for the man in the position of God to try and force the people to accept him as the man of God. There are two anointings – one is by God and the other is by the people. David was anointed by God before he was anointed by the people. Many a preacher was led by God to a church and the church rejected them. He would have no right to veto or force himself on that church’s rejection. 11. It is dangerous for men to assume that because the pastor they respected and admired was a man of God that they automatically were a man of God as well. I was not a man of God because my mentor was, but I sought to be a man by seeking after the God of my mentor. It is arrogance that says to everyone, “I have the mantle” while it is humility that accepts the mantle. Your words do not merit the mantle, but it is the works that merit the mantle. 12. We need to teach all men to strive to be a man of God in the ordained position where God has placed them. One earns leadership while never demanding leadership. You cannot make your people follow you, but you can make you follow Christ. In so doing the same Holy Spirit will draw men to Christ through you who are drawn to Christ. 13. A man in a position of authority will have a far greater influence for God if he also is or becomes a man of God. A husband and a father who is a man of God will be a far greater influence on his wife and family than one who merely has the position, or title, of husband and father. The same is true of a pastor. More authority does not lead to greater influence. More power from God does. 14. We should not allow the influence of a man of God to be lessened, because those in the same position were nothing more than men of position. Saul did not make David any less of a man of God even though Saul was a man in a position of God, who himself was not a man of God. There are many examples of men God in positions of God who were preceded or succeeded by men who themselves were not truly men of God. 15. There is even a difference between being God’s man and being the man of God. I have heard men say when introducing a man to preach, “He is God’s man for the hour.” There is truth to that statement. When a man stands before a congregation to bring the truth of God, he is God’s man for that moment. However, when a man sits before his child and teaches them the word of God he’s also the man of God for that moment or the hour. We are God’s men as we stand to do Gods work. There’s a difference between being God’s man for the moment and being a man of God. When Saul stood before the kingdom he was God’s man because he held the position. However Saul did not seek after God so he could not be called a man of God. For these many years as I have filled the position of God I have sought to be a man of God. However, I have sought to be a man of God for more than just the position of pastor. I sought to be a man of God for the position of father, husband as well as for pastor. Am I a man of God? I cannot answer that question other than to say that for these many years, as I have filled those positions, my greatest desire has been to seek after the heart of my God.